FC Barcelona extend their unbeaten run in the 2017/18 campaign in the opening La Liga game of the season following a confident 3-0 win, which maintains their nine-point lead over Atlético in second. 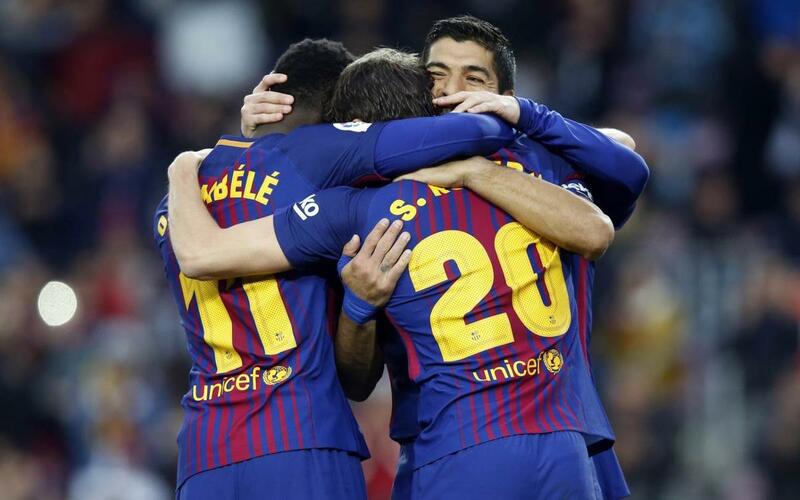 Messi, Suárez and Paulinho got the goals in a very effective team performance in which Dembélé, Vermaelen and the full backs Roberto and Alba all shone. In the sixth minute, Barça took control of the ball, worked it out to Messi, who skipped past a defender and was then fouled by Lerma. The Levante player was booked for his efforts. Messi dusted himself off and swung in a tantalising free kick, which a host of Barça players almost got on the end of. Dembélé, starting his first game since coming back from a long-injury lay-off, showed a glimpse of his trickery on the wing before the Messi-Alba connection took over. They played a one-two, with Alba cushioning a header back into the path of the onrushing Argentine, whose volleyed finish went in off the post to give Barça the lead in the 12th minute (1-0). The goal settled the blaugranas down and they moved the ball around well through Iniesta, Alba and Messi. The captain was making his 650th appearance for the Club. However, Levante were threatening on the counter-attack as the pace of Lerma, Boateng and Doucoure gave Vermaelen and Mascherano something to think about at the back. Ivi almost went through on goal but he was marginally offside. Dembélé came alive again when he drove through on the right but Oier saved his well-struck effort. Soon after, Postigo tripped Messi on the edge of the box and was given a yellow card. Barça’s number ‘10’ took the free kick himself, which cleared the wall but flew just over the bar. The full backs created another goal. This time Sergi Roberto produced an excellent first time cross to Suárez, who controlled the ball and rifled into the net for Barça’s second of the half (2-0). The blaugranas were completely dominant and yet another piece of intricate play around the box, involving Messi and Suárez, ended with a drive from Rakitic, which flew inches wide of the post in the 43rd minute. In added time, Messi went through on goal but his effort was blocked by Oier. The blaugranas went into the break 2-0 up. The second half kicked off much like the first, with Levante straight onto the attack. They forced a corner, which was worked to Ivi. The Levante player dribbled past Dembélé and unleashed a rasping shot that Ter Stegen saved excellently. Then, the blaugranas switched off at the back and gave Levante a little too much space. The away side put together a flowing move, ending with Levante’s right back Moore shooting low to the right. However, Ter Stegen blocked the effort for his second important save of the night in the 65th minute. Levante more than played their part in the second half with the Valencian team showing expansive touches and some good defending but they were ultimately unable to trouble the home side. Vermaelen snuffed out most of their forays forward and the blaugranas controlled the tempo with long spells of possession. In added time, Barça sprung to life one last time as Messi dribbled through the box and fed Paulinho. The Brazilian surged into the box and had a simple tap-in to add some gloss to the score line (3-0). Barça are back in action on Thursday at the Camp Nou. Celta Vigo are the visitors for the Copa del Rey round of 16 second leg, which kicks-off at 9.30pm CET.